under Tillamook County knowledge-to-action network. Through our knowledge-to-action network, we developed a series of high-tech thought experiments, empowering community members to visualize how climate change and local planning could affect their natural and human landscapes. During these meetings our NOAA RISA team identified key stakeholder desires, concerns, and outcomes, such as having access to the beach, creating resilient infrastructure, and protecting homes and businesses. With these end points in mind, the CIRC team then worked with community members, developing a series of probable future scenarios that mixed policy choices with future climate and sea level rise projections that extended throughout the 21st century. By combining multiple drivers of change and policy options in differing combinations, residents in Tillamook County were able to glimpse how their choices could help them adapt to their landscape’s coastal hazards now and into the future. Baron, Heather M., Peter Ruggiero, Nathan J. Wood, Erica L. Harris, Jonathan Allan, Paul D. Komar, and Patrick Corcoran. “Incorporating climate change and morphological uncertainty into coastal change hazard assessments.” Natural Hazards 75, no. 3 (2015): 2081-2102. Climate Change: Assessing How Coastal Communities Adapt Using Alternative Future Scenarios.” Journal of Coastal Research. (Accepted and in press as of November 2017). Submitted to Environmental Modeling and Software (In review as of November 2017). Ruggiero, Peter, Meredith G. Kratzmann, Emily A. Himmelstoss, David Reid, Jonathan Allan, and George Kaminsky. “National Assessment of Shoreline Change: Historical Shoreline Change Along the Pacific Northwest Coast.” US Geological Survey, no. 2012-1007 (2013). https://doi.org/10.3133/ofr20121007. Geophysical Research Letters 44, no. 4 (2017): 1839-1847. Serafin, Katherine A., and Peter Ruggiero. “Simulating Extreme Total Water Levels Using a Time-Dependent, Extreme Value Approach.” Journal of Geophysical Research: Oceans 119, no. 9 (2014): 6305-6329. CIRC research and stakeholder engagement received praise from county commissioners and provided leverage for the passage of the Neskowin Coastal Erosion Adaptation Plan, a community-driven coastal adaptation effort that predates CIRC’s involvement on the coast but builds on earlier NOAA efforts. The Envision platform allowed for the creation of multiple alternative future scenarios by integrating physical drivers aswell as the human drivers into a landscape-specific model. CIRC research and presentations have jump-started important conversations about planning for the future that have bridged connections between researchers, decision makers, and area homeowners. Lessons learned from this project have been applied by our NOAA RISA team to a similar effort in Grays Harbor,Washington as part of CIRC 2.0. During the last few decades, over 65% of Tillamook County’s coastline has experienced shoreline erosion. Approximately 40% of Tillamook County’s recent shoreline erosion exceeded 1 meter (over 3 feet) per year (Ruggiero et al. 2013). Land use has as significant an impact on community exposure to coastal hazards as projected climate change impacts,including in the most severe climate scenarios (Ruggiero et al. 2017). Relying only on the observational record may significantly underestimate what areas of the Pacific Northwest coast are at risk of coastal flooding and related hazards (Serafin et al. 2014; Baron et al. 2015). The 100-year event of extreme total water levels (an event that has a 1% chance of occurring in a given year) could beas much as 90 cm (nearly 3 feet) higher and cause 30% more coastal flooding than previously estimated based on the observational record for the shoreline for Oregon’s Tillamook County (Serafin et al. 2014). When total water levels are taken into account, twice as many homes and businesses in Tillamook County would be vulnerable to a 100-year event by the 2050s as are currently considered vulnerable under today’s climate and existing land-use policies (Baron et al. 2015). Probabilistic simulations of extreme total water levels, long-term coastal change, and storm-induced dune erosion along the shoreline allowed us to represent the variable impacts of seal level rise, wave climate, and the El Niño Southern Oscillation in a range of climate change scenarios through the end of the 21st century. Additionally, we explored a range of alternative futures related to policy decisions and socioeconomic trends using input from our knowledge-to-action network participants. In general, human decisions introduced greater variability and uncertainty to the impacts to the landscape by coastal hazards than did climate change uncertainty. 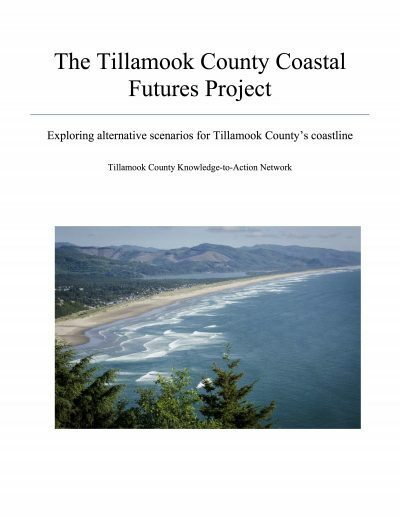 In other words, the Tillamook County Coastal Futures has helped to determine the relative impact of policy and management decisions on the adaptive capacity of Tillamook County, Oregon under a range of future climate scenarios (Ruggiero et al. 2017).